Certain things are precious commodities here in Tanzania. Chocolate chips are one of them. I’ve never seen them sold in stores, not even the grocery store that caters to the expat community. So I had one friend in the U.S. buy this huge bag at Costco and another friend carry it in her luggage when she came here on a work trip. I’ve been nursing this supply for months now; nibbling on a few now and then when I needed a chocolate fix, using some of them in a recently discovered eggless cookie dough recipe. Future plans include a batch of good old fashioned chocolate chip cookies–probably during my Pinterest-fueled plans to have a Christmas cookie baking marathon in a few months (even though I’m the only sweet-eater in the house). Max is a big fan of chocolate chips and this is actually the second time he’s managed to pull the bag down off the top of the chest of drawers in my closet. Why didn’t I learn the first time? 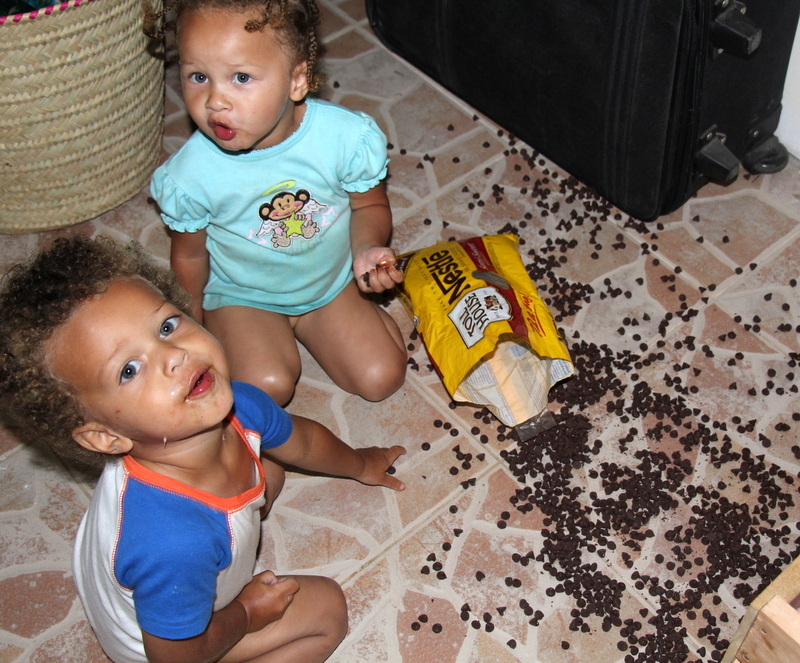 While I was frantically trying to salvage the fallen chocolate chips, Max and Elly were eating them by the handfuls. I’m glad Daddy is around tonight in case there are any upset tummies to manage. And in case you are wondering, I still totally plan on using these chocolate chips. I changed the “Five-Second Rule” to the “Two-and-a-half-Minute Rule” and got them all picked up and put back in the bag. And this time I put the bag deep in the back of the drawer where Max (hopefully) won’t find them. This entry was posted in Twin Fun. Bookmark the permalink.